Anyone who despairs of the individual’s power to change lives has to read the story of Greg Mortenson, a homeless mountaineer who, following a 1993 climb of Pakistan’s treacherous K2, was inspired by a chance encounter with impoverished mountain villagers and promised to build them a school. Over the next decade he built fifty-five schools—especially for girls—that offer a balanced education in one of the most isolated and dangerous regions on earth. 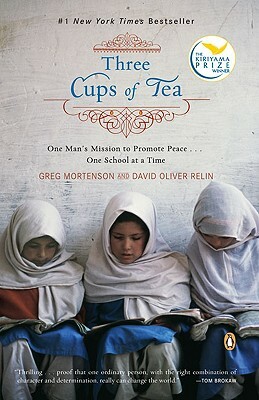 As it chronicles Mortenson’s quest, which has brought him into conflict with both enraged Islamists and uncomprehending Americans, Three Cups of Tea combines adventure with a celebration of the humanitarian spirit. David Oliver Relin is a contributing editor for Parade magazine and Skiing magazine. He has won more than forty national awards for his work as a writer and editor.